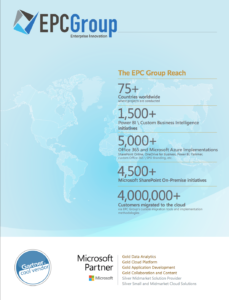 EPC Group offers integration services for SAP applications and Microsoft SharePoint 2019 to allow your users to seamlessly access and collaborate on data from one centralized and secure location. Our expertise around the SAP applications and specific business cases for the integration of data as well as increased compliance will provide your organization with a seamless experience to connect content, users and processes. EPC Group has over a decade of experience in integrating SharePoint with non-SharePoint based systems and other line-of-business (LOB) data sources and we will ensure this integration is done right, the very first time. We understand the underlying technical and business related questions that must be addressed as well as the user experience that must be obtained in order to ensure end-user adoption and true ROI is gained from initiating and SAP and SharePoint integration effort. Our experts have experience in integrating organization’s supply chain, finance and other key departments existing data sources with SharePoint using both the Duet Enterprise solution as well as custom API and other tailored integration options to meet your organization’s specific business need. EPC Group also has experience in very similar scenarios with Documentum, OpenText|LiveLink, FileNet, eRoom, Oracle and other legacy platforms which enables us to ask the right questions and implement the right technology solutions that will stand the test of time.